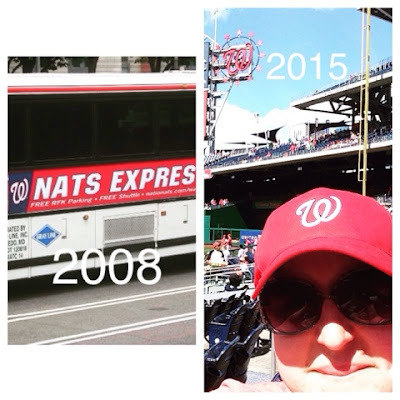 Now, let me be the first to be honest and tell you that in 2008 when I spotted that DC bus…I didn’t take a picture of it because I knew it was advertising the Washington Nationals. I took the picture because…HELLO…it says Nats Express and I’m a Nat-alie. Ha-ha! However, I did return to Northern Virginia/DC in July of 2011 for a visit and where was one of the places we decided to go? Nationals Park for a baseball game; it is the American pastime after all! The minute we walked into the stadium, I knew that I was born to be a Nationals fan – because the Nationals are lovingly referred to as the “Nats” (put a hashtag in front of that if you’re on Twitter, ha-ha) and Nationals fans have “nattitude”…and I was obviously born with that, ha-ha! I immediately bought a hat sporting the signature Curly W and I was in love. Granted, it gathered some dust and was only worn a couple times while I lived in MS, but since I’ve moved to Virginia, I’m declaring my Nationals love on a weekly basis! And the one that really kind of blew my mind! 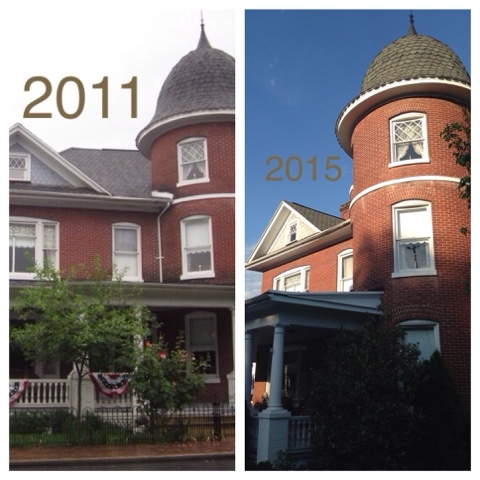 This second picture probably blew my mind just a little bit more – the first time I came to Northern Virginia to visit; long before my Mom had even moved, my Dad was living in Strasburg and apparently while driving around town on July 4th I took a picture of this gorgeous old house. Fast forward to May of this year when I went with my parents to meet their realtor and look at this “gorgeous old house” in Strasburg. I didn’t even put two and two together until earlier this week when I was perusing old photos and I clicked onto the picture. Imagine – taking a picture of a house four years ago…and now I can say I’ve been from top to bottom of that very same house! Life is crazy y’all! Now – maybe some people would just look at those pictures and not think too much else of it, but it got me wondering exactly what I’d been up to in July in many years past – because obviously in 2008 and again in 2011 I was right here where I now live, taking pictures of the same (sort of) things that I’m taking pictures of today. So, for the next year…let’s play the Time Warp and see how far back I can go! Fourth of July fashion – great minds! You’ve got to love a good fireworks show! Camden Yards – home of the Orioles…but this girl is cheering for her Nationals! This Year – Fireworks and the Fourth are kind of a given; who doesn’t love celebrating America? The rest of July has been filled with baseball games and let’s be honest, who doesn’t love baseball?? Okay, I guess a lot of people maybe don’t like baseball – but this chick does and so I loved spending my weekends at the ballpark! Lunch at Filomena’s in Georgetown! En route to the Happiest Place on Earth! Butterbeer – I’ll take all of the kegs. I finally made it to Hogwarts! Triceratops Spin is a real white knuckle thrill ride! Epcot & the giant golf ball, ha-ha! One Year Ago – oh yes, the July of Disney wonder and Universal Studios magic! I mean, sure there were other things that happened in July of 2014 but I know the thing that stood out for me was spending a week in Orlando with the family! I mean, we actually got to go to Hogwarts and Diagon Alley as well as traversing the numerous lands that make up Disney! How can that not be memorable? Also – Butterbeer. I need an anniversary glass…or three… Plus, this was also my first full month living in the wonderful state of Virginia and we started that off right by spending a day in Georgetown! Who doesn’t love posing in a corn field? Nat’s fan for life…from game one! I FINALLY put up curtains a year after the fact…. Front porch sitter & guardian extraordinaire! Three Years Ago – Well, I guess there wasn’t a whole lot going on in July of 2012…I struggled to find pictures! I do know I celebrated the first anniversary of being a home owner in July of 2012 and finally found curtains that I liked for my kitchen – a whole year after the fact! Well…I found a picture of my curtains and a super cute picture of my favorite pup being the best little porch sitter ever! What are you reading sir? Posing with “our” horse in Middletown, ha-ha! Four Years Ago – My Dad had just moved to Northern Virginia, so we drove up to spend a long weekend with him in the new “home” and explored the area. We also spent a day in DC and Lindsey and I took one of our epic pictures with statues…as we are so fond of doing. I also became a homeowner in July of 2011; talk about a big step! They were so little & precious…they’re still precious, just not so little! The beauty queens & I…. Five Years Ago – Ironically enough, It would seem I’ve spent a lot more time in Virginia in July than I have in Mississippi in the past five years! Isn’t that nuts? I passed my time in July of 2010 with some of my favorite kiddos, Hayden and Ashlan (gosh, they were SO little!) and we were also a host home for Mississippi’s Junior Miss; Megen and Kristen were both so sweet and so much fun to have at the house for a week! I rounded out July by heading to the beach with friends from college…but it was literally the last day of July, so we’ll save more of that for August, shall we? Sister lunch in Philadelphia! MS…that is. Brock & I catching up in Meridian. Six Years Ago – Yes, you’re seeing that correctly – we’re the people who are crazy enough to go to Disney World in July not once, but twice! I’m pretty sure we went to Disney to celebrate Lindsey’s graduation from high school…and what better place to celebrate? Lindsey and I also enjoyed the Summer together and I ended the month catching up with an old friend who was in town from California! Red, White & Blue on the steps of the Archives! Our first time eating Five Guys Burgers & Fries – in Georgetown! Funny…I have another picture that looks a lot like this…but it says Virginia! Gaffney, South Carolina…home of Francis Underwood, ha-ha & the Peachoid! On the bridge over the riverwalk in San Antonio! The Japanese Tea Garden – I know it says Chinese, but it’s Japanese…just go with me. I know what I’m talking about. Seven Years Ago – July of 2008 was a busy month, look at all the pictures! We went to DC for a week’s vacation as a family at the start of July; we spent the Fourth of July on the lawn of the Capitol and experienced A Capitol Fourth. It was spectacular…but I’m pretty sure once is enough; the metro in DC can be crazy anyway, but on the Fourth – eek! We rounded out our trip to Virginia by going to Williamsburg, Yorktown and Jamestown and on the way home, we came through South Carolina to see family – and we went through Gaffney, South Carolina, irony much? The month ended in San Antonio with Mom; I joined her for her yearly work conference and explored all San Antonio had to offer! St. Louis Cathedral in Jackson Square! Eight Years Ago – Eight years ago, we were living it up in New Orleans for vacation. Nothing better than beignets, beads and some delicious Cajun food! And while I’m sure July of 2007 had a lot more going on than just a week long exploration of the Bayou’s best city…apparently none of it was worth documenting in photo form! Ha-ha! Perfecting the “selfie” before it was even a thing! Nine Years Ago – The only picture I could find from July of 2006 was one of Brock and I goofing off at Hallmark! 🙂 I’m pretty sure we weren’t supposed to be taking selfies on the job, but oh well. Then again, in 2006 the word “selfies” hadn’t even been coined yet – we took this picture with an actual camera! Unfortunately…I’ve got nothing for July of 2005. So, sad day! Oh no – another year with no pictures to show! Sad but true! Twelve Years Ago – Holy cow! I had been a high school graduate for two months and a whole new world was spreading out before me! Also, my dog Tanner (sweet boy) fathered some puppies and I apparently decided I’d try to carry them all over the yard, ha-ha! We always were so good at posing! The Southernmost Point of the Continental US – awesome! Thirteen Years Ago – We were in Key Largo, Key West…just the Florida Keys in general in July of 2000! I remember the water was crazy clear and warm, the Key Lime pie was to die for and there is a restaurant in Islamorada called the Lorelei and the food is to die for…as well as the sunset! With the big cheese himself – Mickey Mouse! We rode in the front of the monorail! Fourteen Years Ago – Wow. Okay, apparently my family really loves Disney World in July; which seems a little nuts since Orlando is like the surface of the sun in July, but whatever! I’m not sure what else we did in July of 2001 but I was almost a high school Junior and..not to be full of myself or anything…but I could wear that halter top! I’ve got nothing…so I almost went back 15 years…but I didn’t quite make it! Oh well!